First Live Concert: Starship- "We Built This City"
Jody Grunden is the managing member of Summit CPA Group. 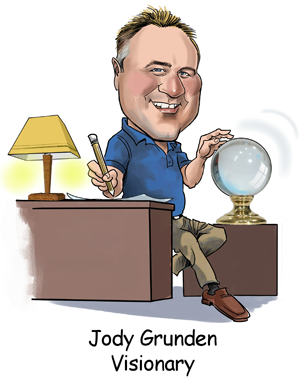 Jody focuses his attentions primarily on Virtual CFO Services. Jody meets with business owners on a weekly basis to assist them with Cash Flow Management, Forecasting, Budgeting, Debt Restructuring, Cost Accounting, and Cutting Edge Tax Planning. Jody takes great pride in helping business owner strive in all economic conditions. He strongly believes that a well run company will excel in both a good and bad economy. Jody began developing his extensive background in accounting and tax by bringing together his experiences in both corporate and public accounting. Jody is also the author of Digital Dollars and Cents. Over 20 years of experience. Jody is a member in good standing of both the American Institute of Certified Public Accountants and the Indiana CPA Society. Jody has a well-rounded professional background with experience in both public and corporate accounting. He developed a broad base knowledge at two regional accounting firms: (1) Crowe Chizek and Company and (2) Geo S. Olive (now BKD). His public accounting background was further enhanced with his corporate experience. Jody worked as the tax manager for a $250 million international, multi-state, manufacturing company, Rea Magnet Wire Company, Inc. While at Rea Magnet Wire Company, Jody stood before the Taxation and Revenue Department of the State of New Mexico and won an appeal for a $300,000 Investment Credit that was earlier denied by the department. The appeal was a Published Decision. Jody graduated from Indiana University with a bachelor's degree in accounting. Jody passed the CPA exam on his first attempt and later went on to obtain his Series 6 and Series 63 license in investing. Jody works, extensively with the QuickBooks accounting software where he has been a QuickBooks ProAdvisor since 2002 and a member of the Sleeter Group where he teaches QuickBooks to small business owners. Jody has been happily married to his wife, April for over 25 years. April is an estate planning attorney for Grunden Law Offices where she concentrates her practice on estate planning, succession planning, and business formations. They have two children, Tyler and Lexi. Their favorite activities are participating in a wide-range of sports from hockey to golf with their children. Jody and April have enjoyed coaching their kid's athletic teams. They also enjoy living in their hometown of Leo and spending a lot of time with their extended family and friends.